With her psychologically resonant sculptures, Beth Campbell brought an uncanny domesticity to the Surviving Sandy exhibition. Her mutated dining table and bathroom sink evoke home life and the embodied effects of trauma on everyday existence. With works that range from elaborate hand written flow charts of potential—and very personal—life events, to videos and sculptural installations that replicate familiar scenes, she adds surreal idiosyncratic effects to highlight the personal in the banal. However, in the context of an exhibition commemorating a community in the wake of disaster, they reference the disruptive effect of natural disaster on everyday life. 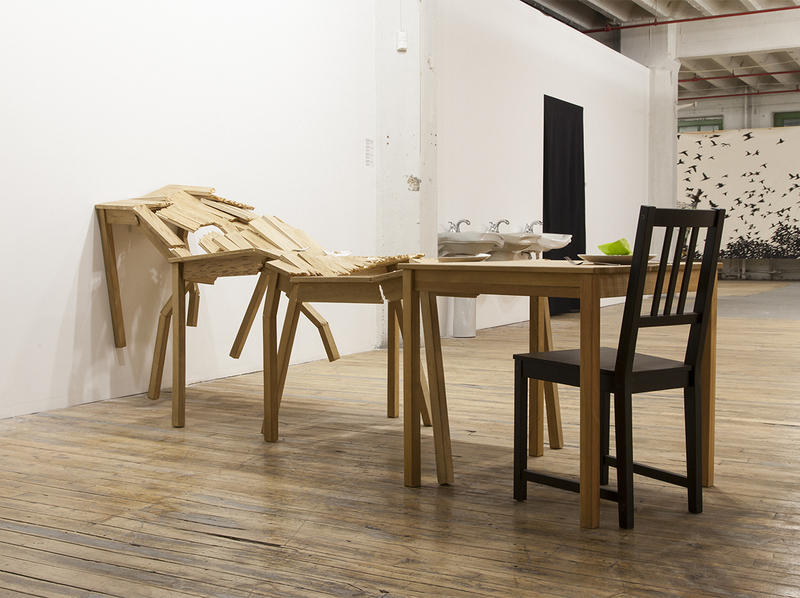 Beth Campbell, “Crashing Tables (Moments crashing…I underestimated the consequences),” 2005. Balsa, pina, china, glue, silverware, napkin, 33 x 48 x 144″. Courtesy of the artist and APT Institute. Photo by Rachel Styer. In Crashing Tables (Moments crashing… I underestimated the consequences) (2005) multiple iterations of a table are posed as if shot in a series of film frames replicated four times over, until it crashes into the wall. Her painterly “sinks” (2010)—two pieces from a larger series—appear to melt from the wall. They are at once functional (they include the faucets and pipes) and useless (the plumbing is not installed). Amidst a show comprised largely of abstract work, these objects are among the few that directly address the effects of a disaster on the physical armature of everyday life. They take on a metaphoric power, reminding us of the unimaginable domestic conditions faced by many after Sandy: no access to the amenities of water, heating, and food—or, even worse, to their loved ones.